In 1905, Modesto inventor Joseph C. Dana filed a patent application for “a writing-guide designed for use by blind persons.”This may be Modesto’s earliest example of “accessible design,” “inclusive design” or “universal design,” i.e., the design of experiences, places and products usable by everyone regardless of ability, age or circumstance. Designing for the widest range of people creates better designs and benefits for everyone. In her 2016 TED talk, Elise Roy asserts that being deaf makes her a better designer: “When we design for disability, we all benefit.” When designers “design for disability first” they create solutions not only inclusive for people with disabilities but better designs for everyone. Roy points to the OXO potato peeler: originally designed for people with arthritis but so comfortable that everybody wanted it. Or SMS texting: originally designed for people who are deaf. How might we transform Modesto into a pioneer and destination for inclusive design? 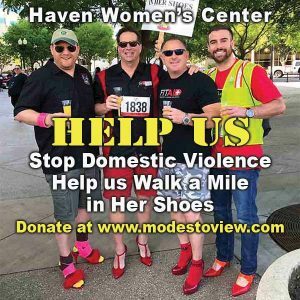 Anyone navigating Modesto’s buildings, public spaces and streets with a wheelchair or walker experiences a city far from universally accessible. But there are promising initiatives underway. 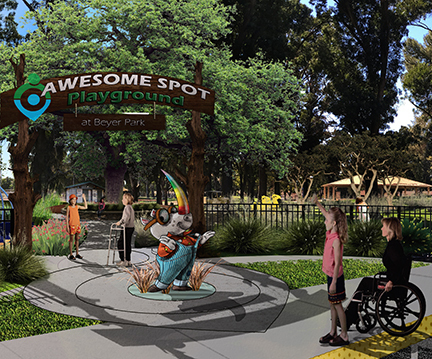 Modesto mom Rachel Loredo is creating The Awesome Spot, Modesto’s first inclusive playground in Beyer Community Park. Loredo’s son Tommy was born with arthrogryposis (the same congenital joint condition of Pulitzer Prize-winning New York Times reporter Serge Kovaleski) and requires a walker or wheelchair. Inspired by a visit to an inclusive playground in Palo Alto where Tommy could play independently, Loredo teamed up with Modesto landscape architect Chad Kennedy to design a similar playspace here. The Awesome Spot is scheduled to open in summer 2018 and will put Modesto on the map as a universal design destination. The design was informed by several community meetings and is envisioned around a nature theme with rainforest, swamp and savanna areas for kids to explore their many senses. Every element has a purpose involving a tactile sensory experience tailored to kids’ age and cognitive ability while leaving a lot to imagination, exploration and play. “It’s not enough to talk about ‘accessibility,’” says Kennedy. “Everyone should be able to play together without barriers or inhibition.” The Awesome Spot is a “socially-inclusive, sensory integrated, intergenerational play space.” It’s not only for special-needs kids. It’s not only for kids, period. 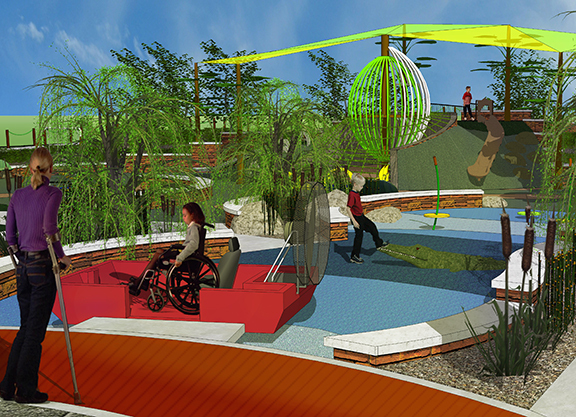 It’s intended to be an “all abilities” play space for everyone. The design brings everyone to common ground, providing dignity and independence for people of all abilities. “Appropriate design recognizes that a child with a disability is a child with abilities,” says Kennedy. Indeed, this unique and awesome play space may inspire the next generation of inclusive designers from among Modesto’s own brilliantly creative, differently-abled young people.